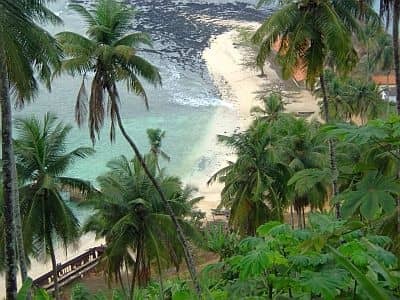 On the islands of São Tomé and Príncipe, located in the Gulf of Guinea and in the vicinity of the Equator, the climate is tropical, hot and humid throughout the year, with maximum temperatures around 30 °C (86 °F) from January to April, and a slightly cooler period from June to August. Both islands are covered with impenetrable forests, and in inland areas there are hills wrapped in mist. Here are the average temperatures of Sao Tomé, the capital. The rains are abundant on the island of Príncipe, around 2,000 millimeters (79 inches) per year in the main town of Santo António. In the southern part of the island of São Tomé, rainfall is even more abundant, in fact, 5,000 mm (195 in) of rain fall per year on the south-facing slopes. On the contrary, precipitation is scarcer in the northern part of the island, where the capital is located. This is due to the fact that it's in the "rain shadow" of the prevailing south-western currents, which deposit much of the moisture as rainfall over the southern slopes of Pico de São Tomé, the highest mountain in the country with its 2,024 meters (6,640 feet). However, both because of the high humidity and the constant presence of clouds, even in São Tomé the vegetation is lush. In São Tomé, about 900 mm (35.5 in) of rain fall per year. On both islands, there is a dry season, a little shorter in Príncipe (mid-June to mid-September) and longer in São Tomé (June to September), but even in these months the sky is often cloudy. On the contrary, owing to the two zenith passages of the sun, the rainiest period are April-May, and October-November. Here are the sunshine hours in São Tomé. The temperature of the sea is high enough for swimming all year round; in São Tomé, it reaches a minimum of 26 °C (79 °F) from June to September. The best time to visit São Tomé runs from June to September, while in Príncipe it runs from mid-June to mid-September, since they are the driest months, when it rarely rains. However, it should be remembered that the sky is often cloudy even in this season. Throughout the year, bring tropics-friendly, loose-fitting clothing, light shirts and pants of natural fibers (cotton, linen) or synthetics that breathe, and possibly a light sweatshirt for the evening; a light raincoat or umbrella for the rain showers. From June to September, you can add a light jacket for the evening. To climb Pico de São Tomé, a sweater, a jacket, a raincoat, hiking shoes.